One of the first things you see through a boulangerie-pâtisserie window in France is a herd of glazed éclairs and choux. Pretty in pink, brown, white, and more often than not, green too. Fondant can be bought in professional shops, most likely in one or seven kilo buckets. But did you know you can make it at home with just two ingredients? It takes around ten minutes to make a kilo of fondant. So get ready to glaze éclairs like there is no tomorrow, because you’re about to learn how to make fondant pâtissier. Here I’ve only made 250g because that’s all I needed for a recipe I’m developping for le petit cookbook, but the recipe can easily be doubled as fondant will keep in an airtight container in the fridge for up to a year. As for the equipement, nothing super-fancy: one large pan, a brush, a probe, a stand-mixer (or failing that, hand-beaters). A plastic scraper is handy too! Place the sugar and water in a large pan. Cook the syrup to 114°C over medium heat. The ideal temperature to make fondant is in between 114 and 116°C, so remove from the heat at 114 an the temperature will naturally reach 115-ish. Perfect! While cooking the syrup, brush the sides of your pan with a wet brush to remove any bits of sugar which might caramelise or even worse, crystallise. Fill the sink with 3cm of cold water and dip the bottom of your pan in it to cool the syrup to 75°C. Pour the cooled-down syrup in the bowl of a stand-mixer fitted with the paddle attachement. Beat for approximately five minutes, or until thick and white. Transfer to a clean work surface. Work the fondant, first with a scraper and then with the palm of your hand until cold. Don’t hesitate to really push it to remove any lumps. Form a smooth ball. Place in an airtight container. Clingfilm to the touch and close with a lid. Keep in the fridge. Use within a year. Ooh yes! Hello 🙂 Love all the little videoes! Thank you for the recipe, well explained, which I am excited to try. Look forward to the following eclairs. Glad you like the little animations. I looove to make them! I always wanted to learn!!! Thanks, Fanny!!!! Is that the same kind of icing we find in the supermarket? It is like a paste that it is used to cover cakes? Virginie, this is fondant to glaze éclairs and millefeuilles. I’ve never used, let alone made “American fondant” before. It might be the same thing although I’ve seen recipes using marshmallows as a base. Possibly to make it more pliable. The fondant pâtissier here is heated to 32°C along with a little syrup and then éclairs/millefeuilles/choux are glazed. I really, really love this recipe! I’ll try it soon! Virginia: there are two different things that are commonly called fondant. Fanny’s recipe here is what ( at least in America) we call ” poured fondant” which you use as a liquid icing and there is “rolled fondant” (a different recipe that I’m not familiar with) which is like a dough and is applied dry to cakes and usually is wrapped around the entire cake and sometimes used to design shapes and figures on fancier cakes. I’ve never tried it though. If you search for those two terms on google you are sure to find more info. love your work! would adding some glucose make a smoother fondant? 1- how do you use it? i mean, to make it liquid in order to pour it on to eclairs, do you have to heat it? with water? 2- can i add a couple of pieces of chocolate, to make it brown and “chocolaty”? What a cool way to prep this post and explain how to work with fondant! I appreciate all the work behind those animated gifs and the beautiful illustrations that I assume do to. Vous avez réussi à faire des merveilles d’une leçon! when beating the cooled syrup in the electric stand mixer, i put the speed on full and once it was thick and white, it was quite hot, and worked it, but it was quite grainy. does it mean the fondant has crystalised or should i beat the syrup on a lower setting??…. i have a chou pastry exam coming up and needed a good fondant recipe to glaze my eclairs with.. thanks! Beautifully designed website. Love the watercolor illustrations and the video ideas. hi, thanks for sharing this recipe. I just gave it two attempts and I didn’t succeed 🙁 i heated the syrup until 114, cooled it, poured into my mixing bowl but very soon after (not at all 5 min) crystallised became a bit grainy too. it was still hot and not easy to work with at all when i tried to knead it into a ball. Any suggestions, what went wrong? many thanks. Bonjour, est-ce que on peu utiliser ce fondant pour recouvrir entierement un gateau? 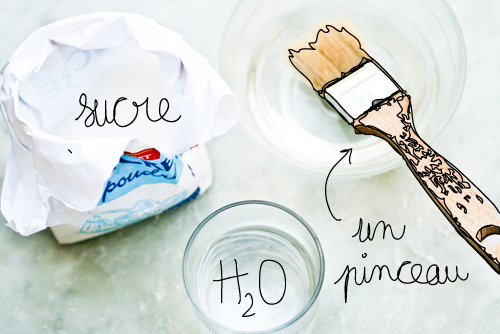 Dois-je alors augmenter la recette? Hi, I’m so sorry, I just realised I submitted my question in French before! – Can this fondant be used to cover an entire cake? – Will the recipe yield enough fondant for an entire cake cover or should I make more?